In order to help you improve your occupancy rates, Rentec Direct is excited to introduce a new Lead Management feature that will help you match tenant prospects to available properties. This new feature goes beyond traditional tenant lead tracking systems and automatically matches a prospective tenant to your available properties based on their interests or rental preferences. Depending on the lead source (email, phone call, or online inquiry) you can create a prospective tenant profile, sometimes referred to as a " Guest Card", that contains a tenant lead's interests. If a prospect finds you online they can fill out their own "Guest Card" about their ideal rental property. At a minimum, these criteria include number of bedrooms, bathrooms, a maximum amount of rent and the city of interest. If a prospect calls or emails you, you can create your own guest card about them or email them back a link to fill out their own prospective tenant profile on your customized marketing website. The system will then automatically scan your properties to find matches based on the prospect’s interests and your available properties that have matching features. For example, if a prospect is looking for a two bedroom apartment under $1000 in Grants Pass, Oregon, the system will display all your available properties that fit this criteria as potential matches. Visit Settings -> Program Defaults. 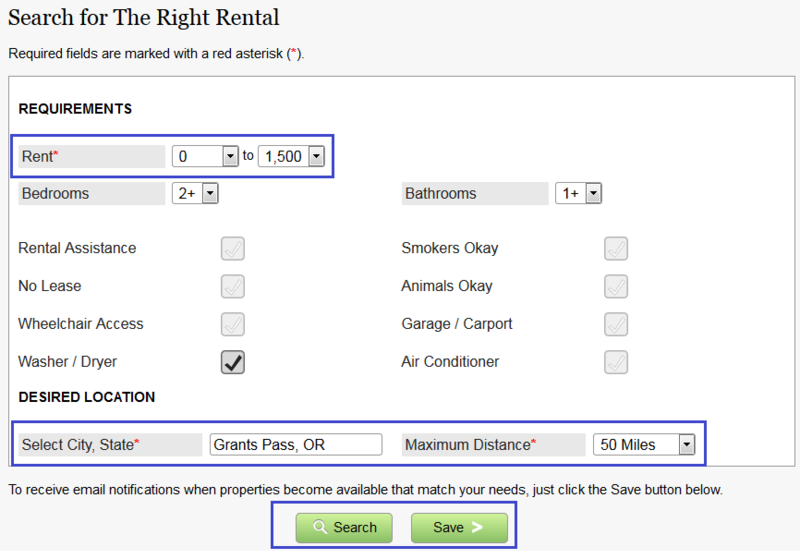 Check the "Yes" button next to "Use tenant lead matching system?" Then click the Tenants tab on the navigation bar. You will see in the left actions pane a new toggle selection for Tenants and Leads, allowing you to switch between them. If your public marketing website is active, visitors will see a Search tab, allowing them to find your properties based on each property’s marketing criteria and description. Check the "Yes" button next to "Allow Leads to save searches on Listings site?" Prospective tenants can now save their search criteria on your marketing website. They will be sent an email containing links to edit their saved property search or unsubscribe from available property notifications. When you add a prospect, only a few pieces of information are required: first name, last name, phone number, maximum rent and the desired city and state. This is the minimal set of criteria for matching leads to properties and being able to contact them. The Required Rental Criteria section includes a number of options. If an option is selected, then the property must have that feature in order to come up in the list of matching properties for the lead. Each property's Marketing Information page now contains additional criteria. Accurate selections on this page are vital to providing searchable properties. Each time you modify a property's details or marketing information, the system will run a check to see whether it matches any of your leads. And, each time a lead is added or updated, the system will run a check to see whether it matches any of your properties. If you use your custom marketing website in the software, visit the Marketing page for each of your properties and select from the new criteria options. Prepare your properties for our upcoming lead generation tools. 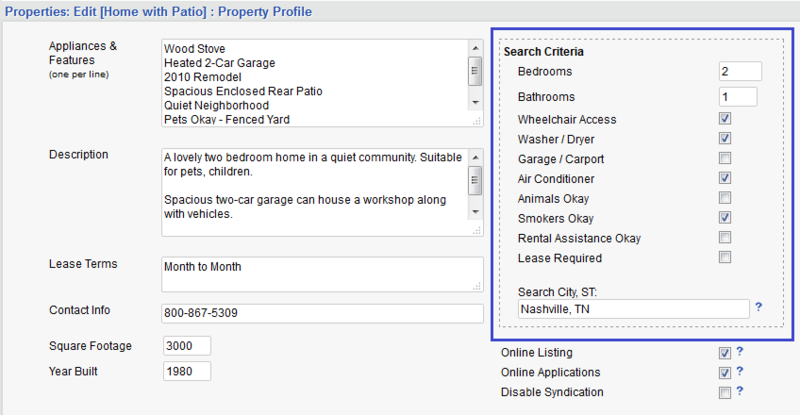 You can find and edit a property’s marketing features by right clicking on a property and selecting “Marketing Info”. As guest cards are generated, your Properties tab will show the number of leads that match each property. Click the “Matched Leads link to view and manage the leads associated to that property. The “Show All” button clears the specific property filter and returns to a list of all leads. If you have opted to use Lead Management, prospective tenants visiting your Marketing page can click a “Search” tab on the navigation bar, providing them with a page of criteria that can be used to find their preferred property in your listings. The property search system on your Marketing page works within our new Responsive design, ensuring ease of use on mobile devices. Prospective tenants can easily search your properties on a mobile phone, tablet or desktop computer, ensuring the greatest degree of accessibility. If you have enabled the “Allow Leads to Save Searches” feature in your program settings, the Save button will be visible on the criteria page. The “Save your Search” page requests some basic contact information allowing you to contact the Lead in the future. Upon completing the Save process, the Lead is sent an automated email containing a welcome message, along with links to return to edit the search criteria or to unsubscribe. The new Lead will appear in your Lead management system. Rentec Direct has created the new Lead Management feature to provide you with a powerful tool to attract new tenants and help them find their desired property with ease. We believe this represents a great improvement in customer service, streamlining your ability to fill vacancies.